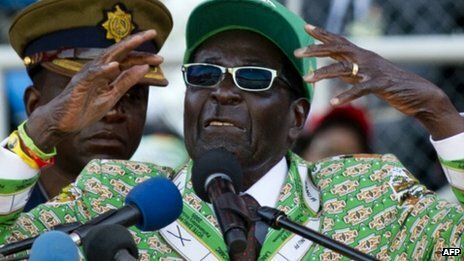 Veteran Zimbabwe President Robert Mugabe said on Tuesday he will step down from 33 years in power if he loses Wednesday's knife-edge election. "If you lose you must surrender," the 89-year-old said at a rare press conference in response to a question about what he would do if he lost. His remarks came as Prime Minister Morgan Tsvangirai's Movement for Democratic Change (MDC) party accused Zanu-PF of doctoring the voters' roll. Zanu-PF denied the accusation, saying it was the responsibility of the electoral commission, which released the roll only on the eve of polls. The BBC's Farayi Mungazi in the capital, Harare, has seen the document and says it features the names of thousands of dead people. Some names also appear twice or three times with variations to their ID numbers or home address. Mr Mugabe will be facing Mr Tsvangirai in the presidential ballot. The two long-time rivals have been sharing power since 2009, under a deal brokered by the regional bloc to end conflict that marred elections in 2008. This year's presidential and parliamentary race brings the curtain down on four years of fractious unity government. It has been marked by allegations of threats and intimidation by security forces but there have been no reports of violence.